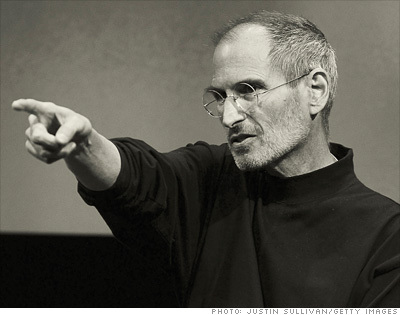 Apple's Steve Jobs is taking a break to care for his health. Steve Jobs urged Stanford University graduates to consider that question in a remarkable commencement speech that captured much of his timeless vision for embracing work, life and love with faith, passion, curiosity, and courage. In a brief address to an audience of cheering young adults, the man who brought us the Apple brand, Macintosh computers, iPod, iPhones, iPad, and the most celebrated animated films ever, shared three stories that revealed much about his life and his hopes for our own. The road map Jobs offered the Stanford graduates invited them to embrace the possibilities and potential of every life, regardless of the set-backs, obstacles, uncertainties, and lessons built into the journey each of us travel from our first moments through our last. Jobs begins his 15 minute talk by sharing the very personal story of his earliest beginnings; his biological mother’s hope at the moment of his birth that he would be raised by parents who could give him a good education – influencing her decision to give him up for adoption – to the lasting lessons learned during his brief attempt at college 18 years later that would profoundly influence his future success; the founding of Apple in his parents’ garage and the journey that led the company to $2 billion in sales and 4,000 employees by his thirtieth birthday; his very public firing from Apple and the brief period of confusion before he realized that he could still pursue work that he loved, leading to the creation of Pixar, development of products that have led Apple’s growth over the past decade, and his return to the helm of the company he founded; his diagnosis with pancreatic cancer and the impact of realizing not just conceptually, but also emotionally and intellectually, that death is life’s great change agent, giving urgency and courage to his pursuits, knowing that we’re already naked before the world. Jobs’ passion for life, decision to wake up each day and ask himself, “If this was the last day of my life, would I be doing what I’m doing,” and unstoppable commitment to making a difference through work and relationships that matter most, continues to inspire thousands of Apple employees and generations across the globe whose contributions as parents, spouses, scientists, teachers, engineers, entrepreneurs and countless other passions will touch our world long beyond the course of our lives. I watch this video and read your description when I am having a rough time with things. It is very inspirational and reminds me that looking back connecting the dots will all make sense.